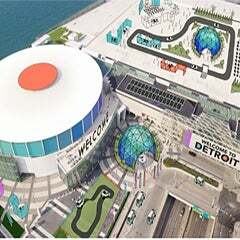 DETROIT Oct 6, 2014 -- Thom Connors, SMG regional vice president and general manager of Cobo Center, is pleased to announce that Cobo Center is the proud recipient of the EcoWorks Sustainable Communities Champion award. During the annual EcoWorks breakfast Sept 19, Cobo Center, along with three other agencies leading the Detroit area in sustainability practices, was designated a champion for aligning with the EcoWorks mission of large scale innovative education, training, consulting, social business and advocacy in the sustainable use of energy natural resources. 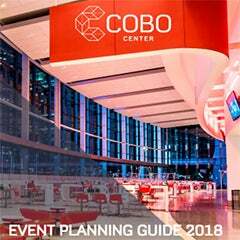 The Cobo Center Green Committee was formed in 2011 to develop green event support and achieve green certifications for the center. 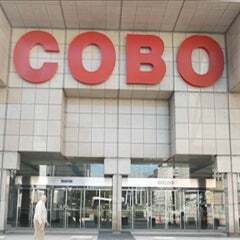 Cobo became the largest Green Venues Michigan facility in 2012. Now in the final phase of a $279 million renovation, building features like a living green roof, Kone EcoMod energy saving escalators and elevators, dock enclosures, induction lighting that uses 40% energy in all exhibit halls, and new energy saving HVAC units are already in place. “We are very proud of this recognition from EcoWorks and the Detroit area sustainability network. However, Cobo Center is not content to rest on what has been accomplished. Our Green Committee is moving very quickly to rapidly increase our waste diversion rate, implement a kitchen waste composting program and apply for other green certifications that will establish Cobo as an industry leader,” said Connors. About SMG: Since 1977, SMG has provided management services to more than 230 public assembly facilities including arenas, stadiums, theatres and performing arts centers, equestrian facilities and convention, congress and exhibition centers. Visit www.smgworld.com for more information.